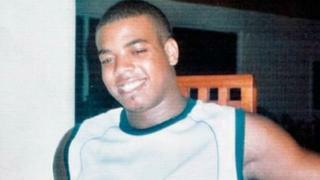 A former police marksman has pleaded not guilty to the murder of robbery suspect Azelle Rodney. Mr Rodney, 24, was travelling in a car that was stopped by police in Edgware, north London, when he was shot six times in April 2005. Anthony Long, an ex-specialist firearms officer with the Met Police, entered his plea at Southwark Crown Court. Mr Justice Sweeney released Mr Long on unconditional bail. He is due to stand trial on 8 June.